Wow it really has been a year since I posted. Funny how pintrest changed the world of art teacher blogging. Our district ended up not striking when a deal was made just days before we were scheduled to walk. One year later it all feels like a bad dream and I am happy it is in the past. Since I haven't been blogging I have gotten bad about taking photos but here are a few from a student choice unit inspired by the art Gwenn Seemel. 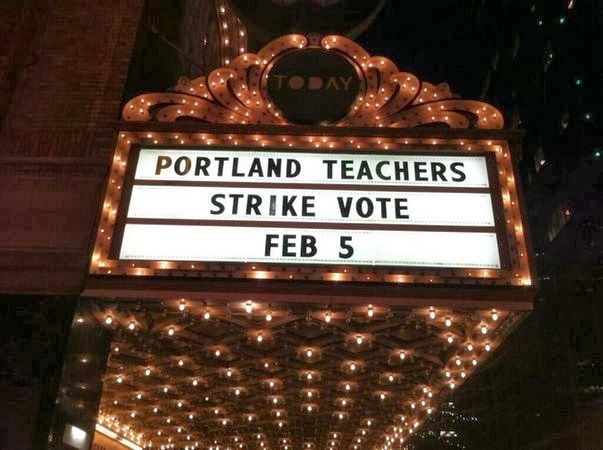 Last night I, along with a large number of my fellow Portland teachers, voted to go on strike in 10 days if the union and the district can not come to an fair compromise. I am a keep to myself, stay out of conflict, kind of gal but I had to go down and vote for this one. I have classes of kids with up to 37 kids, many elementary schools in our district have over 30 students in 1st-5th grade classes and the poor high school teachers have numbers in the 40's. I know that is not what I want for my son when he reaches school age and I don't think it is fair for any of our students. That and some really wonky health insurance threats are my main motivation behind agreeing to strike. After years and years of teacher lay offs agreeing to pay freezes and other measures to make sure that we don't loose staff our district has announced they have found a "SURPRISE" 25 MILLION dollar surplus in this years school budget but are only willing to hire 88 new teachers next year (there are about 3,000 of us in the district). At present time almost all 88 of those teachers will have to go to high schools because the high schools are currently out of compliance with state regulations for hours of student instruction. Most of our high school students are unable to take a full day of classes! For many the final period of "instructional" time they have each day is a study hall. Not too surprising that our HS graduation rates are less than impressive. I belong to a facebook group of local moms (over 2,500 of them in fact) who often post wanting to know what options they have for non public schools in our area siting concern about class size as their #1 reason for not wanting their kids to go to our local schools. If your public school class sizes are so big that parents want to leave the district then their student funding $$'s go with them and then that is bad for the district right? I am so baffled...it seems that the board/district would want to use money to add teachers to lower class sizes to keep more kids at their neighborhood schools to keep/increase funding. I just find this all very confusing and frustrating. If we go on strike this will the first time in the history of Portland Public Schools that the teachers have struck. We are the largest district in the state and I hope that we can come to resolution before the 20th because this will have a major impact on the city of Portland. My mom taught for her entire career and I watched her go on strike a few times. I can still very clearly remember the anxiety and stress in my household during those time. The sick feeling I got watching the teachers on the picket line on the tv always out in the middle of a cold Colorado winter. My mom's sadness and frustration when her classroom got trashed during each strike and the bitterness that was left behind after a contract was negotiated. I am so grateful that at only 2 years old that my son is blissfully unaware of the whole situation. I am almost 100% sure I am the only art blogger from Portland, OR and maybe the only one in Oregon itself (frankly there are very very few art positions in public schools in our state due to funding cuts starting in the late 80's). I know many of you have gone through this in past years and I would appreciate your positive thoughts that we will achieve resolution quickly and would welcome suggestions on how to prepare my classroom if we do have to walk out. I love my students, I love my school. I deeply want quality schools for them and my son. And I need to be able to afford to pay for his and my health insurance too! Chuck Close inspired grid drawings or paintings done by last years 7th and 8th graders. This years group is starting them this week and I came across these photos from last year and realized I never shared. Sadly most of the kids took their artwork home before I could photograph it. Voted favorite project of the year by the 8th graders. Welcome to Mrs. Art Teacher. I am a public school art teacher in Oregon. I'll post K-8 lessons, art history, classroom management and teaching reflection. You are welcome to use my lesson plans and projects. However, please link back to my site when using my photos .